Now that Dobby can no longer hound me about edits to his book, I am free to do with it what I like. So, I am going to rip chunks out of it and sort through my photographs to see if any of them are as good a match as Sonya’s illustrations. In most cases, my photos will be a stretch, but for those of you who have read the book, this should be fun. Let’s start at the beginning. Everybody’s first question is “What in the heck is that?” I’ve even heard a ruder version of that question when a bible salesman spotted me in the front yard. 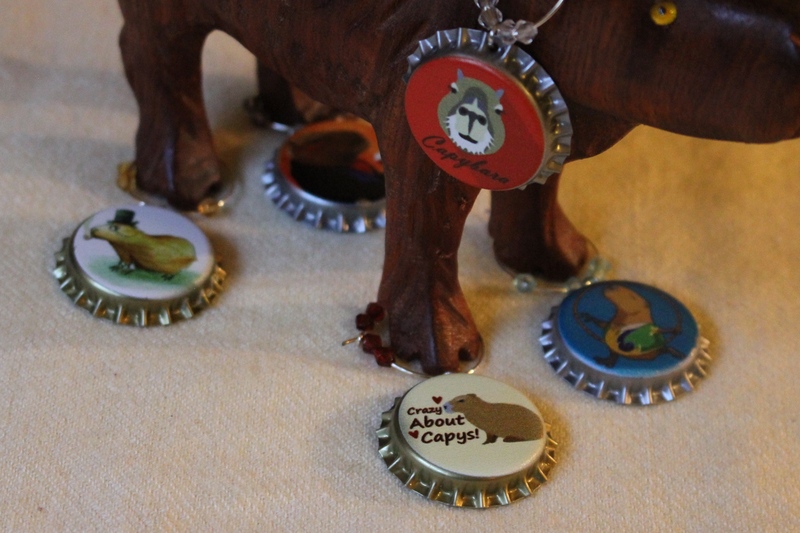 To respond to the folks who are asking, simply uttering “capybara” is completely meaningless. I’m not sure what it is, but it sure isn’t coming into the house! In a hurry to please, people usually perk up and offer the only tidbit of data their puny human minds can dredge up: “From Australia, right?” Young humans seem to be better educated and much politer than the geezers. Kids walk right up to pet me and ask a million questions, hardly waiting for the ever-present Farm Manager to answer. If only I had vocal chords! The “Australia, right?” people hang back, insisting that I am from Australia, well okay, maybe it is New Zealand, while the Farm Manager’s smile purses down into a bite-your-tongue mask of tolerance. Dobby loved to steal corn off the table, so I would pretend to accidentally set it there. That’s when she gives up and out of her big coat pocket she pulls out my favorite treat: corn on the cob. I can bite a frightening chunk out of that corn, right through the husk to the cob, a moon-sized crater, and corn juice flows like lava from my mouth. For those of you who never met him, he was as big as a boxcar. Unfortunately, you’re not looking at me in person, so I put lots of pictures in this book. I’m much bigger than these pictures, though. Try to imagine a potato shaped dog with short legs, a shoebox head, and fur like a coconut. The longest piece of fur I found was 9″ long! Don’t forget the teeth! I have much bigger teeth than a beaver, because they are only the second largest rodent. Or you could picture a cute little guinea pig, a very close relative. Select the basic brown model (we don’t come in colors yet) and blow it up as big as a German shepherd dog, and add slightly webbed feet. Let’s try again. Mini-capybaras are about the size of a guinea pig. How about a hippopotamus with fur like broom straw, skinny legs, get rid of the tail nonsense, but keep the submerged-in-water part, and you definitely want to keep the wiggly ears. The basic idea is that I’m big, I’m chunky, and I can take big bites out of things. Here’s another thing that I’m not: a nutria! Lots of people claim to have seen capybaras “around.” No, they have seen nutrias. Nutrias, or Coypu, are about tomcat size, brown with a big long ratty tail and persimmon orange teeth. Very cute, but an introduced nuisance everybody now regrets. They swim around, dig holes, eat everything in sight, and wreck the wetlands. Then our smaller less destructive muskrats end up leaving town. Speaking of beavers, I’m not one of those, either, but it’s hard to miss the tail difference. Plus, I’m more than twice as big as a beaver, neatly holding down our claim of World’s Largest Rodent. Capybaras come from South America, slogging through the squishy grasslands of every country but Chile. Even though we can swim, none of us live “north” of the Panama Canal. (It’s actually west, check a map!) A few of us got stuck in Panama, between the canal and the mountains to the south. They are a lot smaller than me, and those poor little guys are endangered. Their habitat got kinda chopped up, so they are stuck in smaller, disconnected areas and have to sneak back and forth between a lot of smaller soggy areas. Dobby loved his squishy, stinky lagoon. We big capys are quite common, and in some countries we are ranched and (shudders) eaten. Long ago, a regrettably misinformed pope declared us to be a fish, and we are now a Lenten delicacy. (Takes out a notebook, writes “letter to pope asking for reversal of ridiculous fish designation,” checks incoming email, and continues) I keep waiting to hear that all of the capybaras in South America are relocating to Brazil, where we are appreciated and protected. In retrospect, Sonya‘s illustrations are more helpful. Maybe you ought to check out the book! Be sure to buy it on Amazon Smile and select your favorite charity!